As a professional antiques and collectibles show promoter throughout California, Nevada, Oregon, and Washington State, Dennis Canavan specializes in rare and hard-to-find collectible glass and pottery. His extensive inventory includes: art pottery, depression glass, cookie jars, USA potteries, elegant glass, dinnerware, and figurines. Virtually every major collection is represented in his selections, including Bauer, Blue Ridge, Franciscan, Metlox, Vernon Kilns, and many more. Maxwell Silver Matching Service began 1979 in New Orleans, Louisiana. 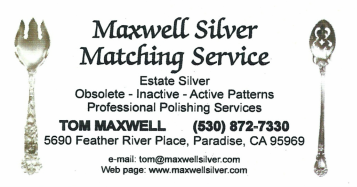 Owner Tom Maxwell, now located in Paradise, California, specializes in estate silver and obsolete/active/inactive silver patterns. His knowledge of silver is legendary. Tom currently appears at 25 antique shows a year in California, Oregon, and Texas. Customers can also acquire silver items by phone or through the web. Professional polishing and restoration are offered to customers. Harvested from her travels or mailed from patrons, trash is transformed into magic, with poignant and exuberant slogans framing creatures, landscapes, and scenes from dreams we all wish we had every night. Shari has created her own way around the commercial art world, selling works reasonably and directly to regular folks and movie stars alike, all over the world. Shari founded the “World Famous Crochet Museum” and co-founded Art Queen gallery (with Randy Polumbo) both in Joshua Tree, California. Since the museum opened 6 years ago in an old Fotomat building, it has been featured on the web, in numerous newspapers and magazines, and an Ovation TV special recently, "The Scenic Route" with David Keeps. For complete estate sales, antique appraisals and household liquidations, trust the experience and service behind Frank Brandow’s Big Valley Estate Sales. Located in the Fresno-Clovis area of California, Big Valley Estate Sales is an experienced professional estate liquidation service that has served the San Joaquin Valley for more than 30 years. Fresno Auction Company holds a solid reputation throughout Central California for both honesty and integrity. For over a quarter of a century, and with thousands of items sold, owner Steve San Sebastian and his team continue to build on their primary focus which is total customer satisfaction. They are specialists in overstock, inventory, estate and antique liquidations. BCW Supplies, located in Anderson, Indiana, provides high quality products to protect, store, and display your treasured collectibles. A large inventory of items includes specialized memorabilia displays and supplies for comic books, gaming cards, magazines, music, newspaper, post cards, trading cards. A family owned business located in Minneapolis, Minnesota, since 1945. Palay Display provides fixtures and displays for retail stores and dealers at professional shows. We purchased locking flat display cases for our special small merchandise. Very helpful and friendly. Fast shipping. If you would like your professional website to be included on our page, please contact us for consideration.